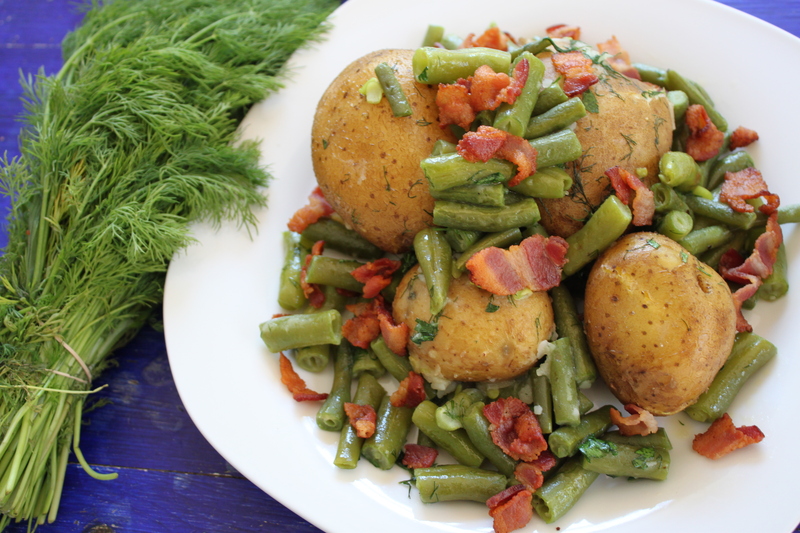 Inspired by Molly Chester and Sandy Schrecengost’s new cookbook Back to Butter, this recipe uses fresh potatoes, green beans, and dill mixed with the smokey taste of bacon. Fill a large-size pot with 3 quarts water, cover, and bring to a boil. While the water is heating (and only if using bacon) in a large-size saute pan over medium-high heat, saute the bacon until very crisp but not burnt, approximately 15 minutes. With a slotted spoon, remove the cooked bacon to drain on a paper towel. Reserve 1.5 tablespoons of the bacon fat. Once the water has reached a boil, add 1/2 tablespoons of the sea salt and the potatoes. Lower the heat to medium, cover with a lid, and boil for 5 minutes, then add the beans and remaining 1/2 tablespoon sea salt. Raise the heat to bring back to a boil, then lower the heat to medium and boil for 15 minutes, or until the beans are crisp tender and the potatoes are fork tender. While the vegetables are boiling, melt the butter in a small-size saucepan, then add the reserved bacon fat (except vegetarians), olive oil, dill, and parsley. Stir to combine. As soon as the vegetables are boiling, melt the butter in a small-size sauce pan, then add the reserved bacon fat (if using), olive oil, dill, and parsley. Stir to combine. As soon as the vegetables are cooked, remove from the heat and drain in a large-size colander. Return the vegetables to the hot pot, then pour the butter mixture over the hot vegetables and carefully fold to distribute. Season to taste with additional sea salt and pepper. Sprinkle with bacon (if using) and serve.